The future 144-car ferry Suquamish is scheduled to launch next year, but it was in two big pieces — one built in Tacoma, one built in Seattle — that are now in the same place on Harbor Island. Half a ferry sailed up the Sound from Tacoma Wednesday night and met its other half in Seattle. The future 144-car ferry Suquamish is scheduled to launch next year, but it was in two big pieces — one built in Tacoma, one built in Seattle — that are now in the same place at the Vigor shipyard on Harbor Island. 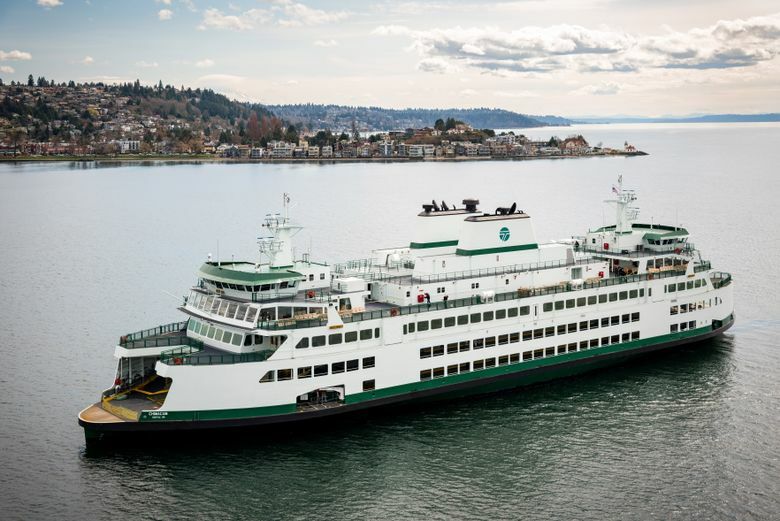 The Suquamish was built this way for two reasons: It’s faster to build in two places at once, said Ron Olson, production manager for Vigor, and it also spreads around the taxpayer money for the Washington State Ferries project. Vigor and its subcontractors have been building ferries this way since 2008. The top part of the Suquamish was loaded onto a barge Wednesday night at Jesse Engineering in Tacoma, where it was built. It arrived at Vigor on Thursday morning. The hull, which is being built on Harbor Island at Vigor’s facility, will be drydocked. Then the shipbuilders will use four transport rigs and a system of brackets to help lift the 1,600-ton top half and attach it to the hull. A team of 30 fitters and welders will work joining the two. The $122 million Suquamish is the last of four 144-car “Olympic class” ferries being added to the state’s fleet. The first was the Tokitae in 2014, followed by the Samish in 2015 and the Chimacum earlier this year.